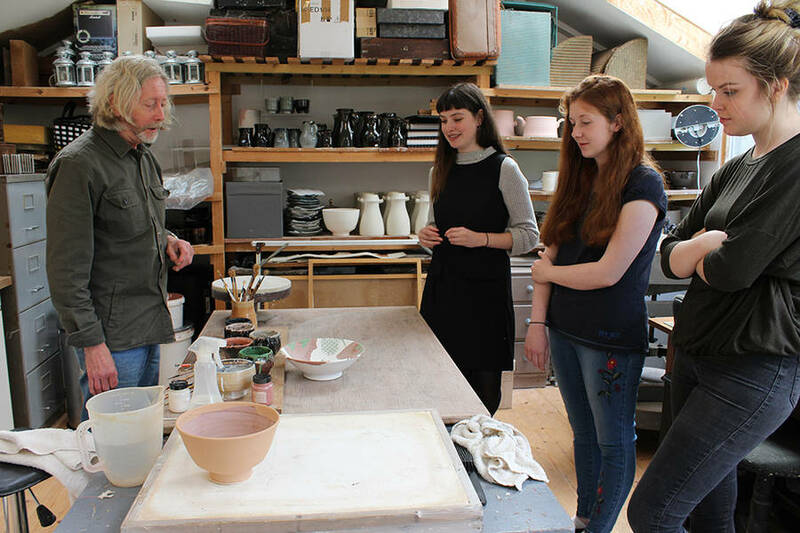 On Thursday 3 August we spent the morning at Archie McCall's studio near New Abbey where we were shown his ceramic collection. I particularly enjoyed learning about anagama kilns and how falling wood ash in the kiln becomes the glaze on the pots. The pots are sometimes fired on shells which crumble in the firing, leaving calcium marks on the final pot. Archie has been a potter for over 45 years, beginning his apprenticeship in 1970. A graduate of Edinburgh College of Art, he taught Ceramics firstly at Duncan of Jordanstone College of Art and then at The Glasgow School of Art for over twenty–five years, during which time he became Head of Ceramics and subsequently Programme Leader for all the BA(Hons) Programmes in the School of Design. The next day we went on a trip with Hannah and Doug to Postfest in the Pens. It was great to see all the different stalls full of such a variety of styles.